This isn't 'good nationalism'. This is nationalism - as ever, in an English context - as forgetting. A response to Zoe Williams. Image: London Olympic games ceremony, 2012. Credit: Julian Behal/PA Images, all rights reserved. The problem with this kind of narrative is it omits how all English nationalism – even supposedly the ‘good’ kind – allows us all to ignore inconvenient truths. Narratives that sacralise the NHS - or indeed any of our better achievements or virtues - as part of our nationalism, risk making us complacent. We all love the NHS, fair play, queues, warm beer and decency. These things will always be with us, with any temporary lapses promptly corrected. So the story goes. 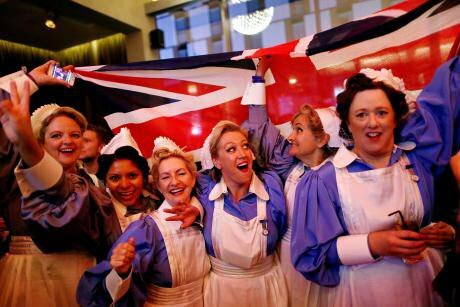 Of course in 2012, just as Boyle’s dancing nurses brought a lump to our throats, the government was enacting the most destructive anti-NHS legislation in history, destroying (in England) its core principle that people got comprehensive healthcare on the basis that they lived here, and needed it, that had endured since 1948. Just a couple of months before the 2012 Olympics, Theresa May also publicly announced the “hostile environment” policy, making it progressively harder over the next few years for migrants to access healthcare or other basic rights, as well as making life progressively more uncomfortable – or impossible – for migrant workers in the NHS. The Tories genuflect to the NHS as a ‘national religion’ almost as much as Labour - but that hasn’t stopped them disestablishing it and excommunicating large numbers of people from it. And not just migrants, incidentally. Overweight people and smokers are now being banned from all routine NHS procedures across at least a third of the country, a policy strongly opposed by doctors. Sajid Javid suggested last week that the hostile environment “did not represent our values as a country”, and Jacob Rees-Mogg yesterday called the policy “unBritish”. But Eric Pickles called the aforementioned NHS fat bans “not the kind of Britain I recognise”, too. It seems evoking Britishness doesn’t save us. ‘Good nationalism’ vs ‘bad nationalism’? Is ‘bad nationalism’ really confined to the Other, to the unashamedly right-wing both here and across the pond? Williams says, “I have no problem with a bordered civic identity: our borders describe the limits of our democratic agency.” She adds, “Good nationalism… includes, by definition, every man, woman and child who contributed to the achievement”. But Williams fails to spell out who this is. Those Caribbean nurses who came here to build the NHS, now finding themselves or their children denied healthcare, and worse? The Commonwealth doctors, routinely discriminated against? The slaves who were forced to help ‘this nation’ establish its wealth? Williams doesn’t say, and such vagueness is not good enough. This isn’t ‘good nationalism’ – this is nationalism (as ever, in the English context) as forgetting. Forgetting that the NHS was not just built “together, as a nation”, as Williams suggests. It was built by a nation that had built its wealth on the back of empire and slavery, by overwriting brown people’s “civic identity”, a nation that had no qualms about interfering in its colonies’ “democratic agency” just long enough to exploit all that could be exploited – and not a moment longer. It’s a message that has been powerfully brought home lately, with the very Commonwealth workers who came over here to help build the NHS, shamefully denied healthcare for themselves or their families. Even now, too many responses to the Windrush scandal fall into inherently flawed tropes of ‘good’ and ‘bad’ migrants, with the ‘bad migrants’ category including children, pregnant women and torture victims and people with infectious diseases, all of whom are still now being refused free healthcare. The former head of the NHS attacked these policies as a “national scandal” when Jeremy Hunt rolled out upfront passport checks and charges last year. But the grossly exaggerated story of so-called ‘health tourism’ won’t go away, carried by the insidious bleating about ‘an international health service’ that’s travelled from Nick Griffin’s mouth, to Nigel Farage’s, to Jeremy Hunt’s, to even that other bastion of liberal national pride, the BBC. This sounds like a very Blue Labour take (or Blue Corbynism…?). Do we really want to relegate our “generosity” to merely a side-effect of patriotism? Our most generous service – the NHS – has also been our most cherished, for that very reason. The NHS is not a side effect of patriotism. It is, as Bevan himself said, “pure socialism”. And “innovation” in science and medicine has nothing to do with patriotism, either. Our greatest discoveries have been built on cross-border, non-profit collaboration for centuries, and continue to be so – though threatened by Brexit. Mangling history to provide comforting myths won’t provide the effective countervailing ‘narrative’ to ‘bad nationalism’ that Williams says the English need. Indeed it just makes ‘bad nationalism’ worse. We need proper history, not more myth making dressed up as ‘narrative’ and ‘framing’. By proper history, I mean a history that acknowledges the role of empire in building our welfare state. A history that doesn’t just portray the NHS as a ‘reward’ for ordinary people that ‘we won’ with our fortitude and sacrifice during our ‘finest hour’, delivered by rulers with an inherent sense of ‘fair play’ and ‘never again’, imbued with the ‘Spirit of 45’ and immediately able to see and embrace the common sense of applying wartime state management to public needs. We also need a history that acknowledges that in fact the NHS’s creation – and that of the rest of the welfare state – was as much to do with elite fears exposed yet again by the demands of war; fears of an enduringly sickly and unproductive workforce, of the pull of communism, and indeed, their fears of a recently demobbed, militarily-trained working class. Less than a month after Boyle’s Olympic opening ceremony, the government announced it was setting up ‘Healthcare UK’ to help the NHS ‘brand’ to be exported overseas, particularly to the Gulf states, with private firms allowed to “partner with” and benefit from the NHS’s brand recognition. Broadcasting the NHS brand so powerfully to nearly a billion people was undoubtedly useful in helping “public and private sector organisations” build their global healthcare exports. Whatever Boyle’s good intentions – and the government’s reported initial discomfort – perhaps our desire for a ‘good nationalism’ (gleefully reported at the time) is all too easily hijacked to export (neo)colonialism for the benefit of a few, just as ‘bad nationalism’ was. There is no such thing as ‘good nationalism’, as applied to England, in other words, a nationalism that serves the interests of ordinary people. There is only English nationalism that undermines those interests, that harms our solidarity both in our communities and globally, and that’s a figleaf for pursuing the interests of elites, whilst playing divide and rule amongst the rest of us.